A few months ago, a friend of mine gave me a lovely gift. 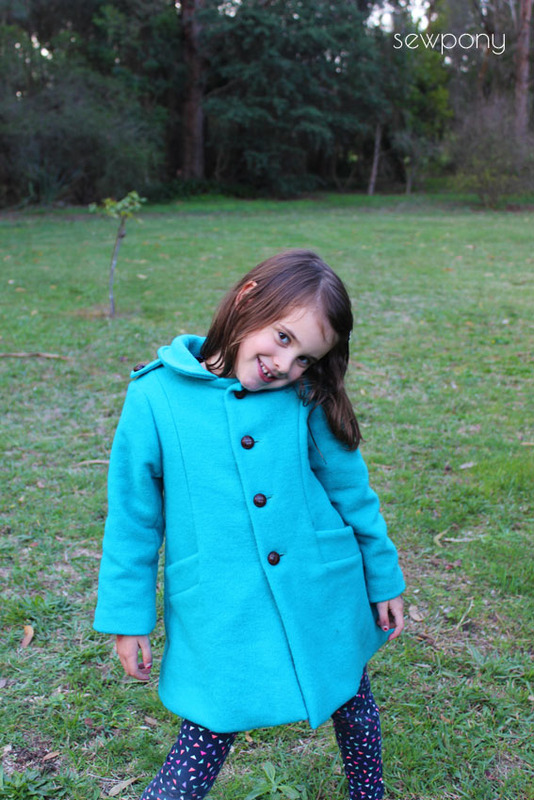 A beautiful blue coat that she wore as a girl of six or seven in her then home country of England. 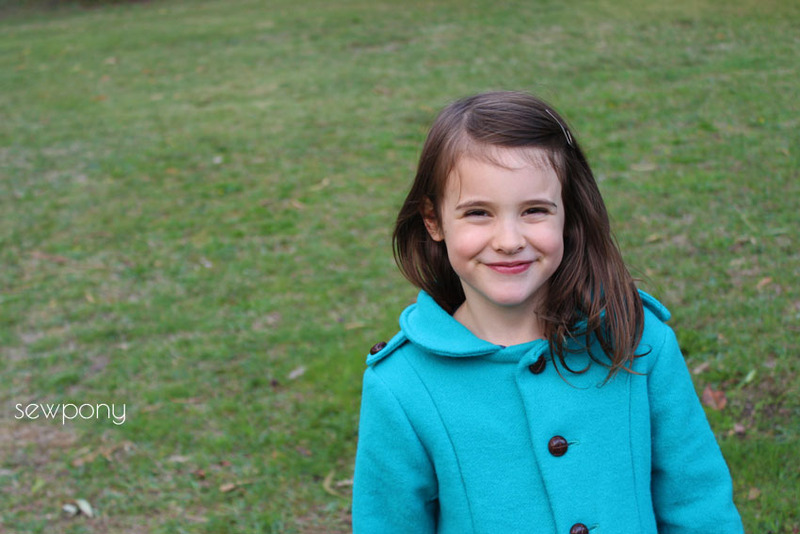 The coat has beautiful lines and details and fits Isabella perfectly. You may have seen this picture I posted on instagram recently. I was inspired to reproduce it and so made a coat for Juliette. 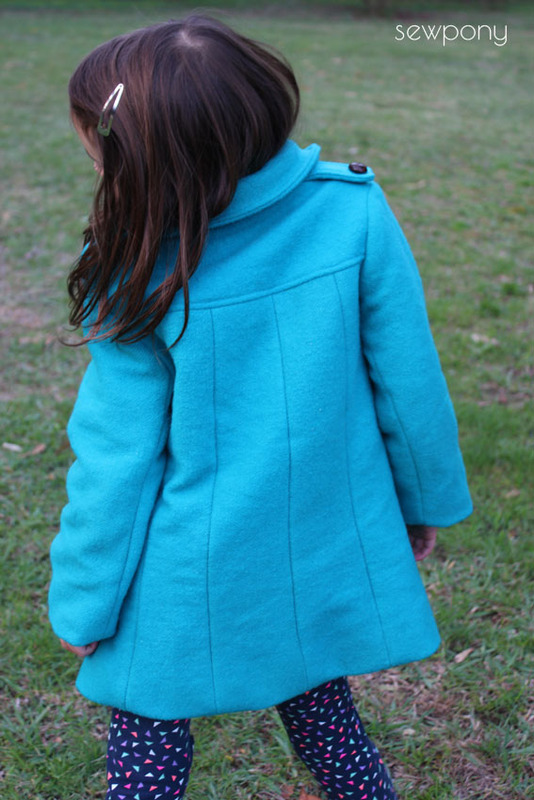 I just love the back design of this coat - five panels and a back yoke make up the back piece. I have never seen this detail before and think it is beautiful. Top stitched epaulettes accent the shoulders - I used vintage looking wooden buttons. 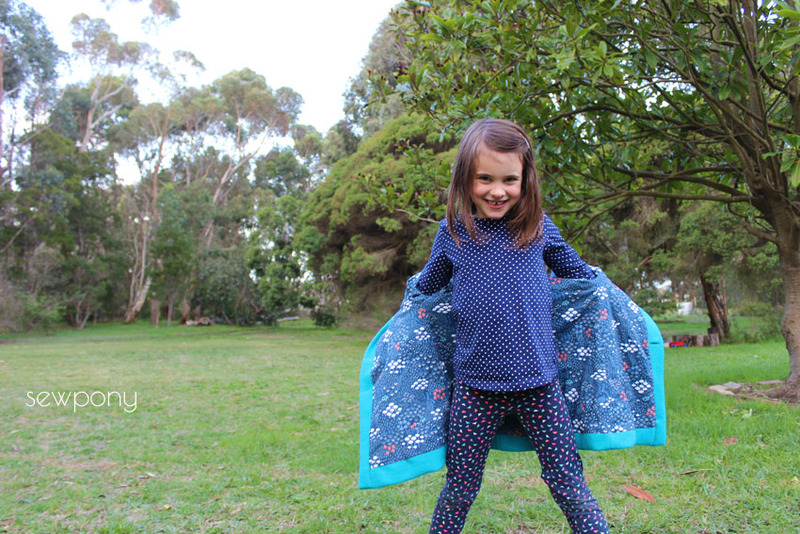 The main fabric for this coat is a recycled turquoise wool blanket given to me by a sewing friend - thanks Katrina! I love the front seams that turn into pockets. The sleeves are made up of two pieces - you can see the under arm seams in the picture below. 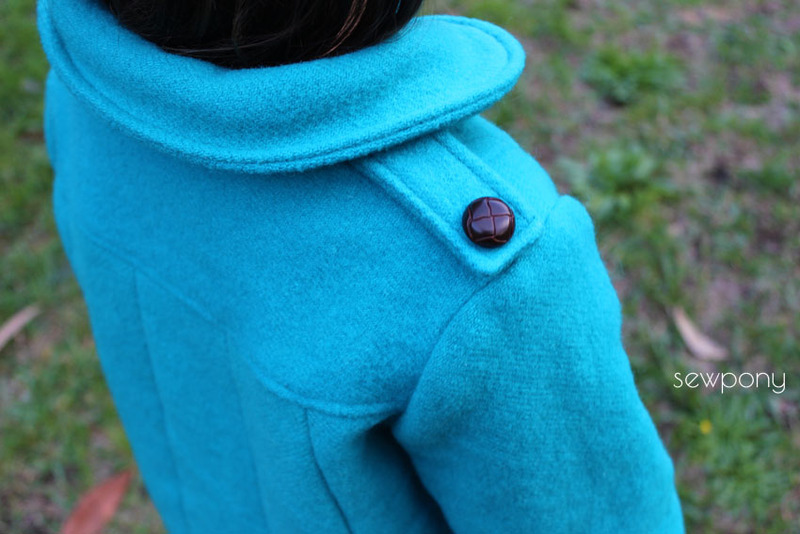 This coat features a rounded collar (while the original collar is pointed), My collar could have been better - it is not rounded enough on the inside edge so it tends to sit up a little bit. 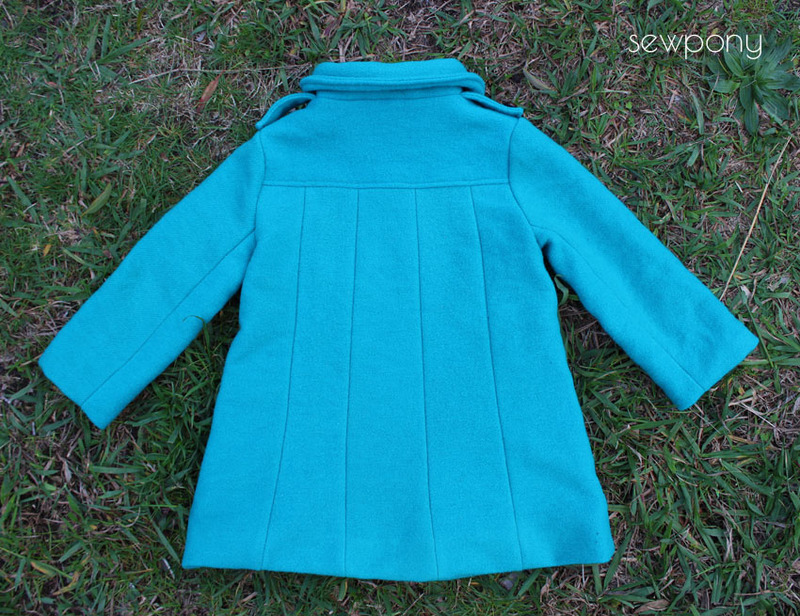 I lined the coat in a Cloud 9 fabric - Wildwood by Elizabeth Olwen I purchased about nine months ago from Spotlight. I love that Spotlight (which is three minutes from our house) stocks Cloud 9! I love that this coat is made from a blanket - recycling is fun! Juliette wore this last weekend on a cold Sunday and she was toasty warm! Feeling inspired to make a coat? 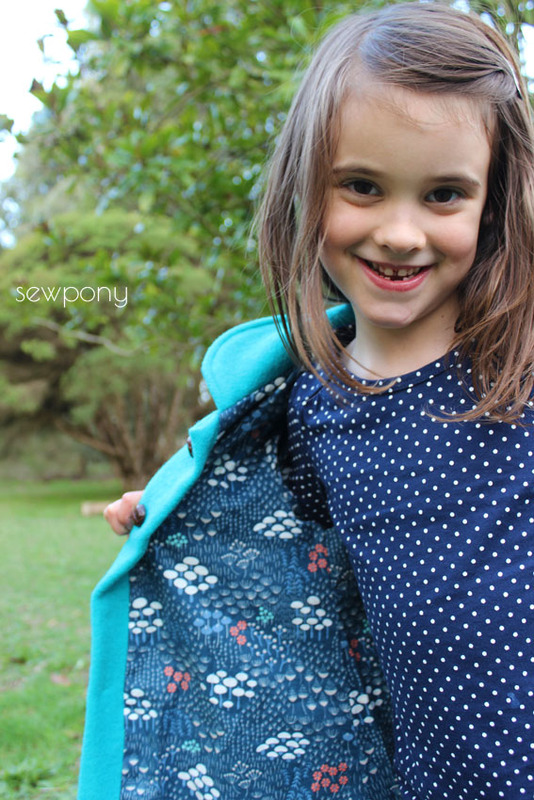 I am excited about making a Moiano coat for Emily - my current work in progress. 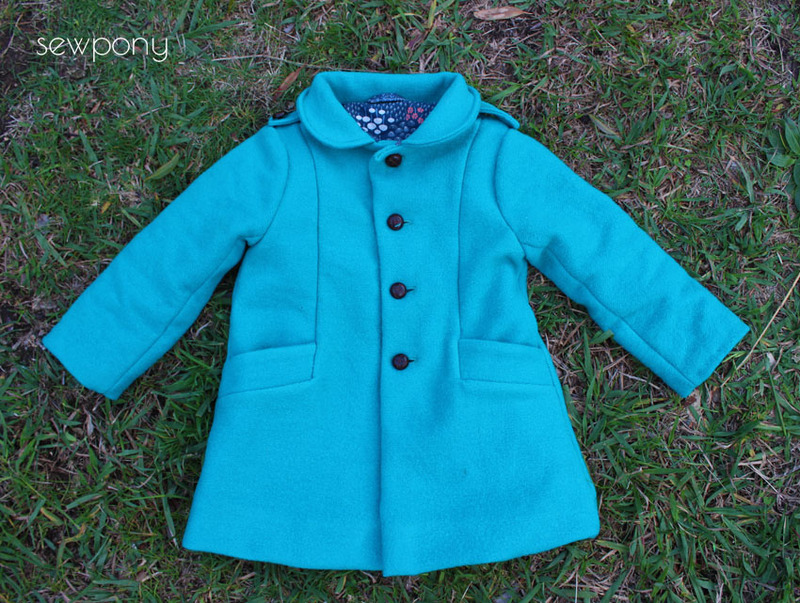 The latest pattern by StraightGrain is amazing, and after drafting this coat, I can very much appreciate the work that must go into drafting a detailed coat pattern!! Oh, I like that coat!! The back is simple and special at the same time. That blanket has got an exited new life! So beautiful!! I hope you would consider making a pattern- though I'm sure it would be a big job. Traditional, nice coats are so hard to find (in my price range!) for my 6 year old. Thanks for sharing! You did a fab job (as usual)!! Gosh!! That coat (and girl) are just darling!!! I really love those back lines. I hope you make a pattern, I'm looking to sew up several different winter coats for my little Miss. Thanks everyone! Certainly no pattern this year but maybe next!! it is really nice!! Very curious to see your Moiano! Wow! What a stunning coat!